Remove one hub and check it is engaging. With it removed, run engine with it in low box and in gear and watch if the halfshafts is spinning. Replace hub and do the same to other side. If the halfshaft isn't turning then the problem is that side of the axle. If both turn, then you likely will fix it when you service the hub. To test further you can remove the hub and fit fixed flanges. 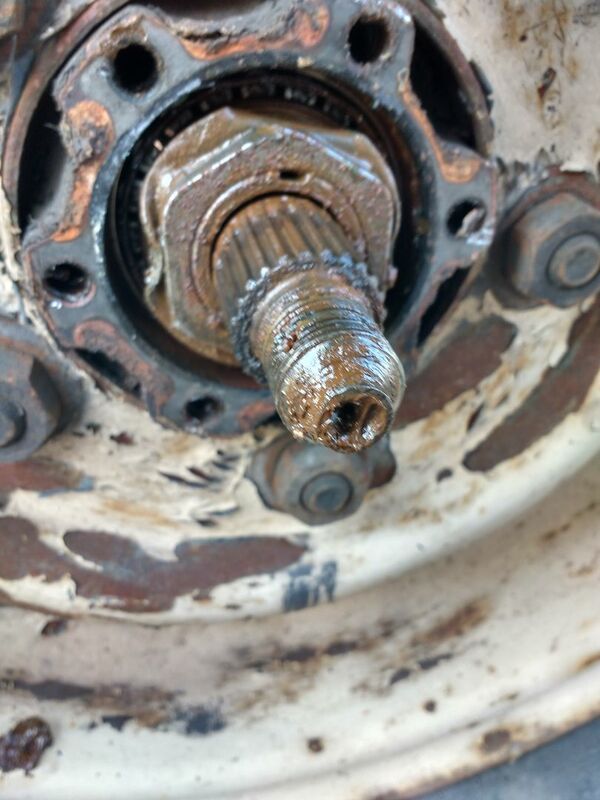 If the axle is OK, it will drive. If it doesn't drive, then you need to remove the shafts and/or the diff to check. I will explore all suggestions. Thanks ..
Ill let you all know ,, there's nothing more annoying than lots of suggestions and no outcome . Yep. Bowie69's steps detailed above will help diagnose exactly what's wrong. As Fridge said, it may well just be a FWH that's not engaged properly. They're usually pushed into engagement with spring pressure so that the splines or teeth mesh when they first line up. Otherwise you'd be having to faff rolling back and forward or turning the prop to get everything to line up as you turn the knob. This does mean that if they are partially seized inside, the spring might not be enough to push into full engagement even if they feel like they're positively clicked into 4wd mode. Because of the differential, either one failing will lead to loss of drive. With the vehicle vehicle stationary, any gear and 2wd will turn the rear prop shaft, half shafts and rear wheels. 4wd (high or low) will also turn the front prop shaft and half shafts. If you have standard hubs, the shafts will turn the wheels. If you have free wheeling hubs, then if engaged, the wheels will turn but if disengaged the wheels are not driven by the shafts. When driving, 2wd will provide drive to the rear prop, half shafts and wheels, but not the front system. 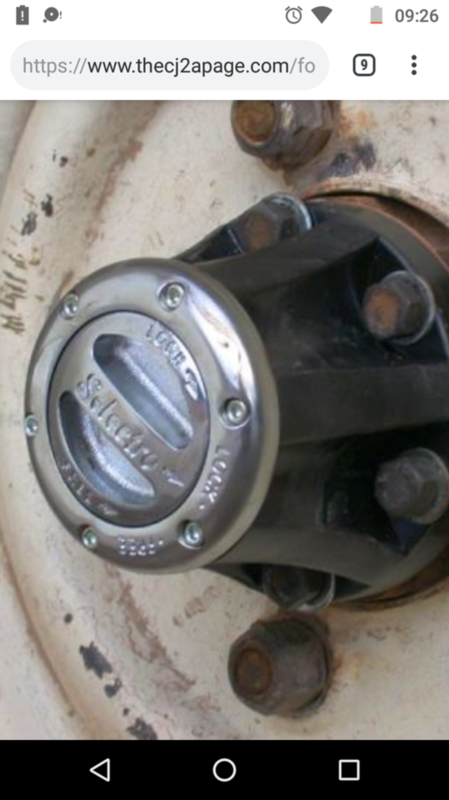 If you have standard hubs or free wheeling hubs are engaged, then the wheels will be turning the half shafts and prop shaft, even though the prop shaft is disconnected from the innards of the transfer box. If the FWH are disengages, then the wheels will not turn the shafts, so the front half shafts and prop shaft will be stationary (or slow). Driving in 4wd (high or low) will cause both prop shafts and all drive shafts to be driven by the engine, but disengaged FWH disconnect the front half shafts from the wheels and so while the gear box is turning the innards of the front axle and the car's motion is turning the front wheels, the front wheels are not driven. Engaging the FWH will cause the front axle to drive the wheels in 4wd. Remember that the differentials are "open diffs", so if one wheel on an axle looses grip, it'll spin up while the other ceases to be driven. That is not a fault. However, if a component fails, then drive is lost at that point. 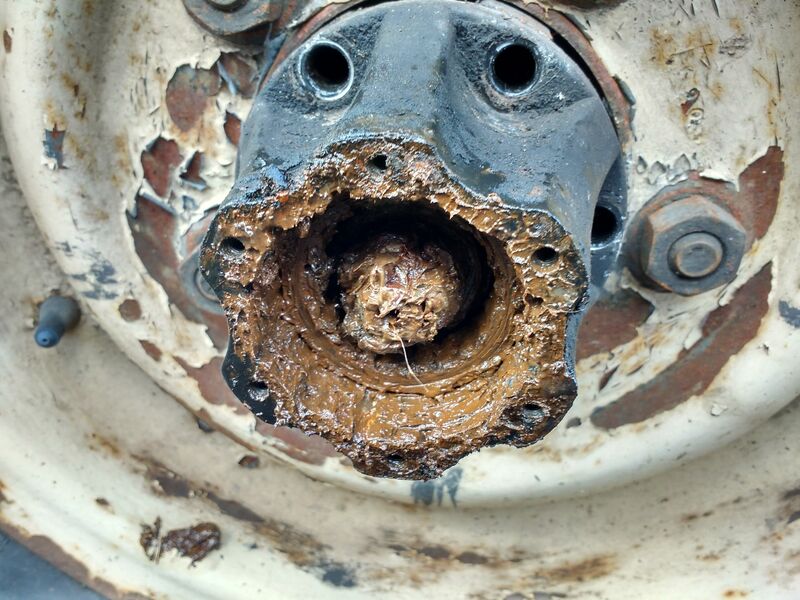 If a single half shaft or hub fails, then that axle behaves as if grip is lost on that corner and the opposite wheel will lose drive too, and this appears to be what has happened in your case - the rear axle has been isolated while you repair a worn out prop shaft, but the front axle has been disabled by a fault in the diff, half shaft(s) or hub(s). So this morning I have raised both wheels 1 at a time , when I rotate them both individually in FWH lock and unlock they do not rotate the propshaft , where should I go next ? The 4wd does seem to engage because it is turning the propshaft but the wheels don't turn the propshaft and the propshaft doesn't turn the wheels ? 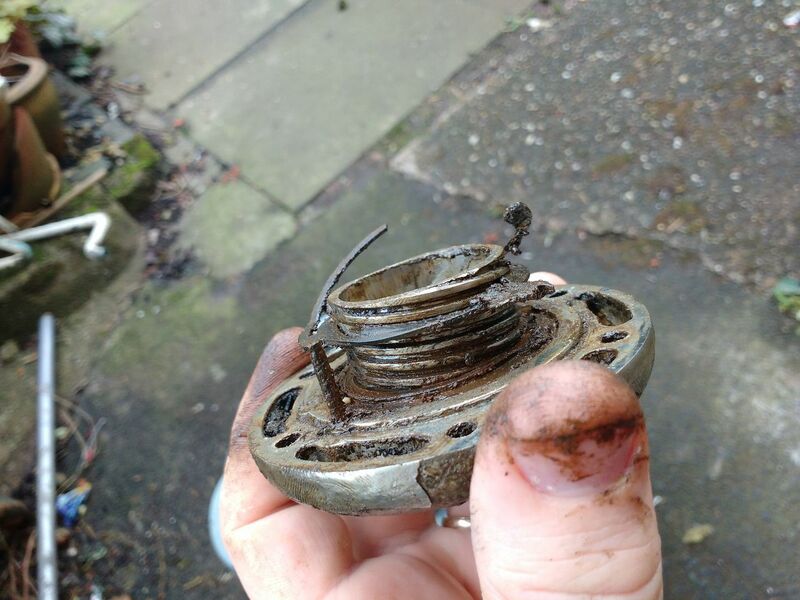 Would a faulty FWH stop the other side working , if I dismantle hub what am I looking for ? OK, so the problem is definitely with the axle not the gearbox. Yes, one broken or not properly engaging FWH will cause those symptoms. As will a broken half shaft. Remove the FWHs. It should be pretty obvious if they're seized or broken. Rotate the end of a half shaft. The other end should rotate the opposite way or the prop flange should rotate. If not, you've likely got a broken half shaft or UJ. Before getting too far in with anything else, have a look at the hubs though - they're the most likely culprit. The simplest thing to do, I think is to fit the standard flanges to the front hubs. Purely for testing, swap them from the back and test again, off road. Ok massive progress today , I cant seem to get the FWH off ( advice needed please ) however I did get the front of the FWH off so I could see the shaft , So , the internals were all covered with grease ( not a bad thing ) nothing was rusted , however the wheels turn by hand with hubs locked or unlocked , , wheels however do not turn propshaft....but if I place wheels on ground whilst I press gas the halfshaft on the drivers side can be seen turning in the hub ,but not catching and the one on the passenger side moves intermittently , so hopefully it's the hubs. All I need to do now is to get the hubs off ,any advice please ? , I have taken the bolts out however ivd been trying to pry them out with a hammer and chisel , its moves slightly but not a lotb, is it just a case of peservance !! Thanks for all the ongoing help , I'm assuming now that it's the hubs not catching the rotating shafts . 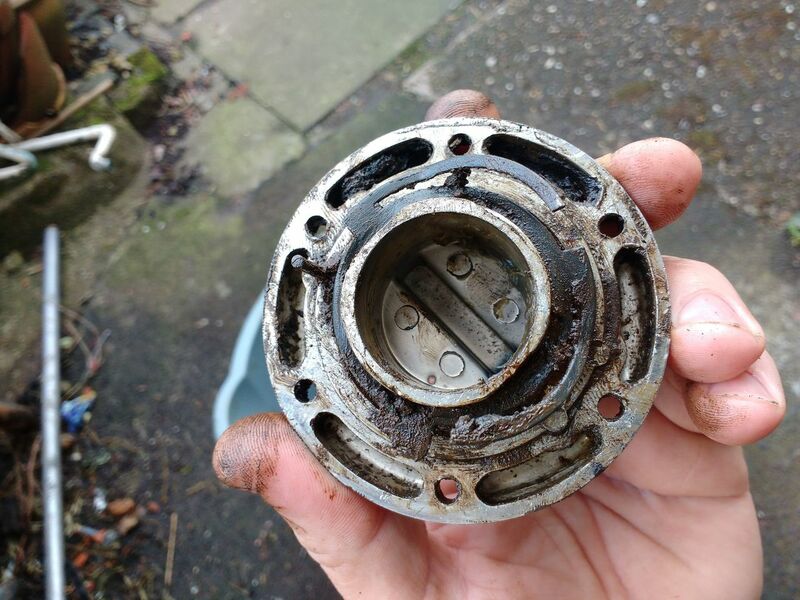 Can I buy original hubs X2 as a kit or do I need to buy individual parts ? 2 x castellated nuts 2x large washer 12x bolts , 2 x hub driving member gaskets , do I still need the felt washers , if so can you still buy them ? lo-fi your video was very helpful thanks . Nice, sounds like it's the hubs. Double check what half shafts you've got before buying anything. Should be 24 spline rather than 10, but you never know if it's been swapped out by a previous owner. Drive flanges are available as pairs, felts etc. are all available. 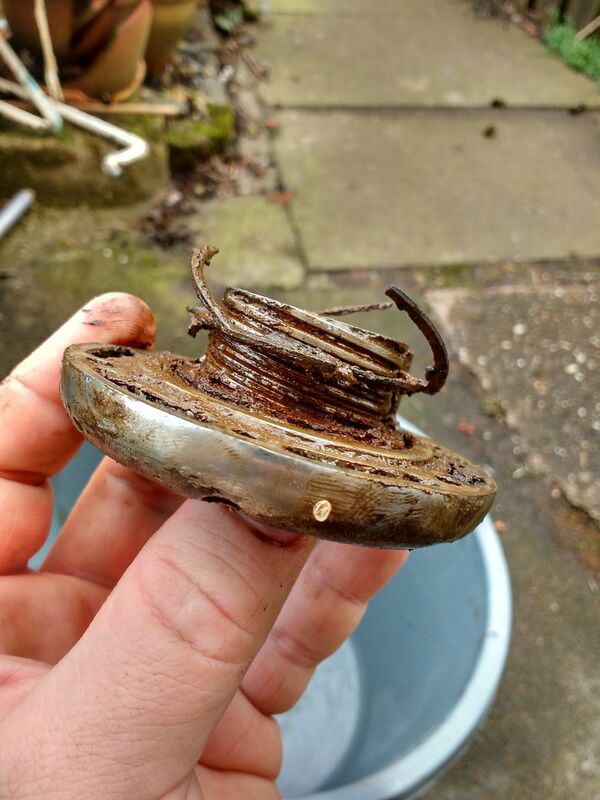 Castle nuts and washers can be re-used unless they've been frackulated - might save a few pennies. Post some pics of the hubs if you get stuck removing. Glad you found the YouTube helpful! There are different makes of FWH, and as you might imagine the mechanisms inside the covers are different. If you tell us the name or initials on yours we may be able to sort you out with the appropriate instructions. A photograph of the covers may also help (a picture of the 'covered in grease' parts probably isn't as helpful). I'll take a lot of photos tomorrow and forward , thanks , being that one of the half shafts literally isn't turning when the other is leads me to think that the half shaft on the side is also broken , being that it isn't my daily ride anymore (it was for a long time ) I have the luxury of opening it all up to see what I need first rather that getting loads of parts I don't need and returning them but I'll let you know . 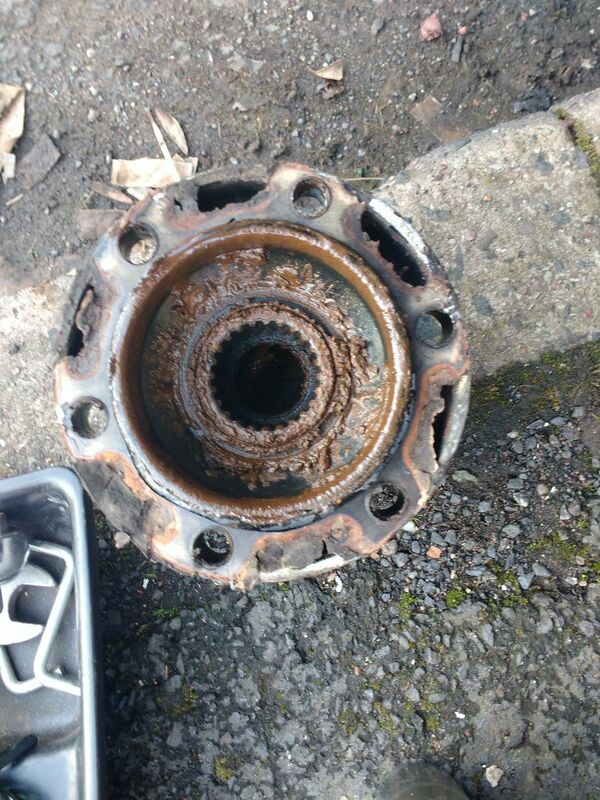 These are the same hubs as mine , mine aren't as clean and shiny , selectro. That thread covers the same problem, removal and has the instructions attached as pdf. Pull the split pin and castle nut and they'll come straight off. It was the hubs which is a massive relief the annoying thing is ( probably eBay them ) that 99% of them are in perfect working order , I'm assuming it's no surprise to others that the little metal barbed clip that slides up the thread and depress the surround around the spline had deteriorated . What a lot of fuss about a badly designed metal clip , I'm just ordering some fixed hubs , I really appreciate all of your contributions. I was ready to give up and sell the bloody thing (regular accurance). Seconded, otherwise you might want to sell it again in a few months. I'll do that thanks , does anyone sell these fragile metal clips that fail in the FWH , ( I'm not refitting them, just wondered ) it just seems a massive waste , these FWH have failed due to a clip that looks like it could be made for 50p breaking , not a great design . ... does anyone sell these fragile metal clips that fail in the FWH , ( I'm not refitting them, just wondered ) it just seems a massive waste , these FWH have failed due to a clip that looks like it could be made for 50p breaking , not a great design . I've looked through two different presentations of Selectro Installation instructions, which have included an exploded diagram of the parts, and cannot identify the parts you describe. Again, a clear picture would help. Poor old girl. She'll be better for having fresh bearings that aren't lubricated with mud! They will be causing a problem!